What Do Scientists Use To Accurately Measure The Distance Between The Earth And The Moon? What Famous Internet Worm Led To The First Federal Computer Crime Prosecution? Scientists have grappled with calculating the distance between the Earth and the Moon since ancient mathematicians set their minds to solving the problem. Aristarchus of Samos (310-230 BCE) used lunar eclipses to attempt to calculate the distance of the Moon from the Earth. Building off of Eratosthenes’ calculations determining the size of the Earth, Aristarchus used lunar and solar measurements along with a bit of geometry to arrive at the conclusion that the Moon was around 240,000 miles from the Earth. That’s a shockingly accurate calculation for its time given that we now know the average distance is 238,856 miles. While using mathematical proofs to come up with a pretty good, but not dead accurate measurement is impressive, we can now calculate the distance to the Moon with laser precision. 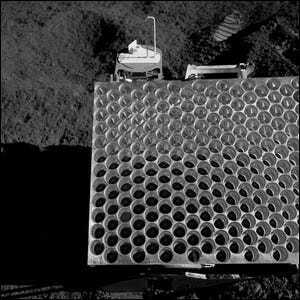 Starting with the Apollo 11, 14, and 15 missions, and continuing with the two Lunokhod missions (along with the upcoming private MX-1E lander mission), retro-reflectors have been placed on the Moon as part of the Lunar Laser Ranging experiment. Back on Earth, scientists are able to fire powerful lasers from observatories and measure the reflected photons returned by the retro-reflectors on the Moon. In ancient Greece, they could calculate the distance to the Moon with a margin of error around a few thousand miles. Today, armed with lasers and constantly experimenting with pulse rates and new calculations, scientists are creeping closer to measuring the exact distance to the Moon to within a few millimeters.